Japchae, jabchae or chapchae is a Korean noodle dish made out of dangmyeon (sweet potato starch noodles) cooked with vegetables (carrots, onion, spinach, and mushrooms) and meat which is served hot or cold. The name japchae in English means “mixed vegetables”. A dish popular in Korea, severed usually as a side dish but can also be served as mains. Japchae was invented by Yi Chung during the 17th century as a dish to be served to King Gwanghaegun who had held a big gathering at the palace during those times. The king so loved the dish and in return promoted Yi Chung as his Secretary of the Treasury. 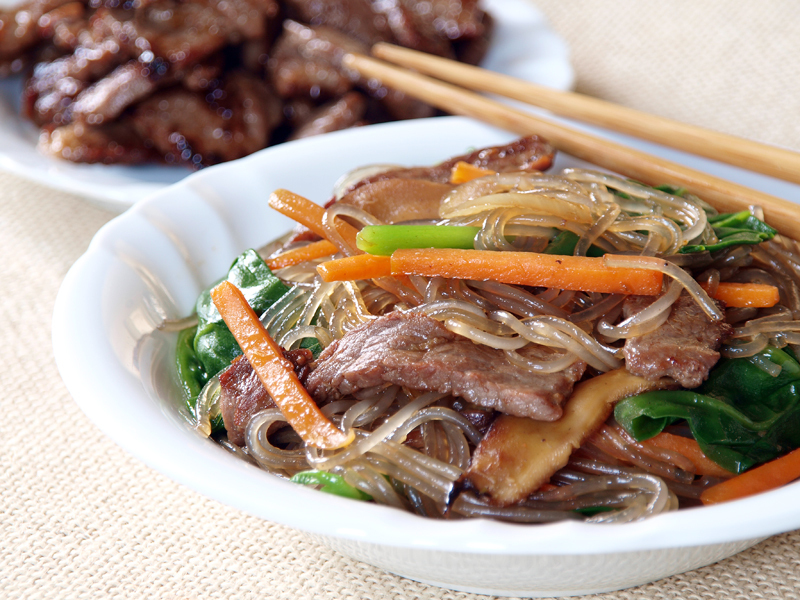 During those times japchae was made only made out of only vegetables (no noodles) similar to the chopseuy then in the 20th century dangmyeon was added and become a primary ingredient of this dish. Another simple noodle dish which you can pair with Korean Barbecues, rice and kimchi and in my personal opinion, this is better if enjoyed cold rather than straight out of the wok. Cook noodles according to instruction, drain then set it aside. Season beef slices in salt and freshly ground black pepper. Blanch your spinach or choysum, and then rinse it with cold running water, set it aside. Prepare a wok add oil then in high heat stir fry beef pieces for around 2 minutes. Set this aside. Add garlic in the wok then sauté for 30 seconds. Add mushrooms then continue to stir fry for 30 seconds. Add carrot and onions then stir fry for a minute. Add the cooked noodles and vegetable greens, beef, soy sauce, cayenne, sesame oil, salt, sugar and freshly ground black pepper. Mix well then turn off the heat. Serve it hot or cold. I like my Japchae to be a on the sweet side…weird yata yon? This looks so good. I’m so happy I found your blog. I learn so much about dishes from the other side of my world. Hopefully, I’ll gather up the courage to try a few of them soon because they look exquisite! That looks wonderful, I am all in! I’ve been wanting to try sweet potato noodles. Oh I’m sure that I’m going to love that! I never tasted those noodles! I can see why it was made for a king:) I have never seen sweet potato noodles.. is this something new that just came out or am I looking in the wrong store? I think I could happily eat noodles every day of the week–possibly, at every meal. I’m not sure I could find those noodles, but they sound awesome. Great recipe. You don’t run out of amazing recipes! Seems like almost every Asian culture has their own version of chap chai. My fave is the ones with salted cabbage, vinegar and left over roast duck. It’s such an appetising dish because of its sour spicy taste! sweet potato starch noodles sound delicious! Plenty of the veges inside this noodles is simply great and I too do that most of the time, looks very inviting. My wife and I japchae, but of course have never made it before. thx for sharing a recipe for it. I always order Japchae when I go to Korean restaurant and I even tried making it at home several times. But my recipe is missing something and I’m not satisfied with it. It’s time to try yours! Yummy! This is right up my alley! I love Korean food! noodle looked delicious.. i haven’t tried korean dish yet.. This sounds delicious!! I’ve got to make this! Try Korean shops they have the Authentic ones. Thank you, I have been looking for this recipe, first time I tried it was in a Korean restaurant. Love it! Yeah I love the texture of the noodles. The taste is great as well sweet spicy and savoury. What type of soy sauce should I use? Can I use the typical filipino soy sauce like datu puti? What type of soy sauce should I use? Can I use the typical filipino sou sauce like datu puti? where can i buy the noodles?